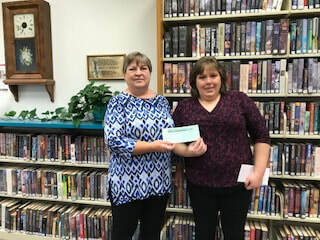 Cassville Branch Library held a Show Your Library Card Contest the week of October 22 through 27. Patrons who presented their cards received an entry plus an additional entry when they checked out an item. Three lucky winners were drawn from nearly 700 entries. They each received $100 in Cassville Cash to be used at participating Chamber merchants in town. The activity was sponsored by the Cassville Area Friends of the Library. Call the library to see how you can get a card. Shown on the right is Theresa Lewis receiving her winning certificate from Cheryl Williams, branch supervisor. Other winners were Eli Roark and Janeth Henbest.